I only ever have your best interest: consider making twice as much filling because you will end up on the couch with a spoon. This is for real. This lemon filling is like lemon pudding if lemon pudding won the lotto, bought a black Bentley, drove to the airport, flew to a Polynesian beach, put up a hut and ordered margaritas until the sun went down. It's that rich and that happy. A lot of times you'll hear people say "less is more" and that is very sound advice when it comes to great cooking and baking. I practice this advice all the time and make great meals with few quality ingredients. But sometimes more is more! Like ice cream with split banana, hot fudge, caramel sauce, roasted peanuts, whipped cream and cherries. I'm OK with that. And I'll have two of those please. 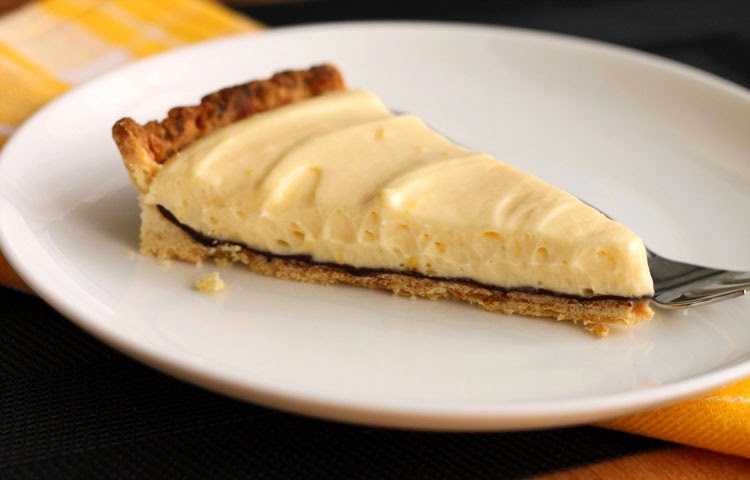 Or, like this tart - flaky pastry enrobed in dark chocolate and topped with luscious lemon curd enriched with white chocolate and whipped cream. When you think about it, your standard lemon curd usually uses butter, so replacing butter with white chocolate isn't all that scandalous. The difference is that cocoa butter - the main ingredient in white chocolate - has a very sharp melting curve that happens to be right at our body temperature. This means that cocoa butter melts quickly within a very narrow range of temperature as opposed to butter that melts gradually over a large temperature range. That also means that this lemon filling melts instantly on your tongue leaving you with the creamiest, silkiest, smoothest texture. Mixing the chocolate with butter is essential to soften the texture of the chocolate when it sets. If you imagine chocolate at room temperature or in the fridge, it's hard. If you even imagine butter in the fridge, it's also hard. 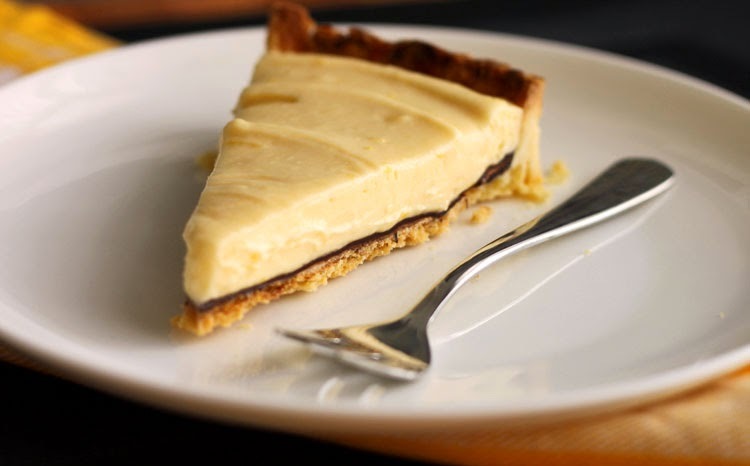 So although you need to keep this tart chilled during storage, it's best to let it come up closer to room temperature before serving so that the butter in the chocolate layer softens a bit so you can cut through it. Otherwise, the pastry will snap and break as you cut through the chocolate. To achieve a soft texture even from the fridge, I'd suggest making a ganache (here or here) with chocolate and cream and letting that set before spreading the gorgeous lemon curd on top. To ensure we get this tart into our stomachs as fast as possible, I've made a time-saving no-roll pastry. A bit of cream cheese makes it pliable so we can push it into the tart pan and a bit of baking powder provides some insurance for the tender and flaky. To make the pastry, combine flour, sugar, salt and baking powder in a large bowl. With your fingers, work the butter and cream cheese into the flour mixture, breaking it up until they’re well incorporated into the flour, leaving some bits of butter the size of oat flakes. With a fork, lightly toss in milk until mixture is moistened and comes together into a shaggy dough. The mixture is ready when it holds together when squeezed in your hand. Turn mixture out into a clean 9-inch tart pan and press it evenly into the bottom and up the sides. Try to get the dough as even as possible, but don’t worry too much about finger indentations. (You may not need all of the dough.) Cover and refrigerate for 1-2 hours. When ready to bake, preheat your oven to 375°F. Prick bottom of pastry shell all over with fork and bake for 25-30 minutes or until golden. Transfer to a wire rack and let cool. To make the lemon filling, whisk together eggs, egg yolks, sugar, lemon rind and lemon juice in a heatproof bowl and set it over a pot of simmering water. Cook, whisking frequently, for about 10 minutes or until thickened to consistency of pudding. Remove from heat, add white chocolate and stir until melted and smooth. Transfer mixture to a clean bowl, place plastic wrap directly on surface and refrigerate for 1 hour or until thoroughly chilled (you can do this a day in advance). Meanwhile, to make the chocolate layer, gently melt together chocolate and butter over low heat or in the microwave until smooth. Spread evenly over base and slightly up the sides of the cooled tart shell using the back of a spoon or a pastry brush. Let set in the fridge. In a separate bowl, whip cream to soft peaks and then gently fold it into chilled lemon curd. Spread into pastry shell. 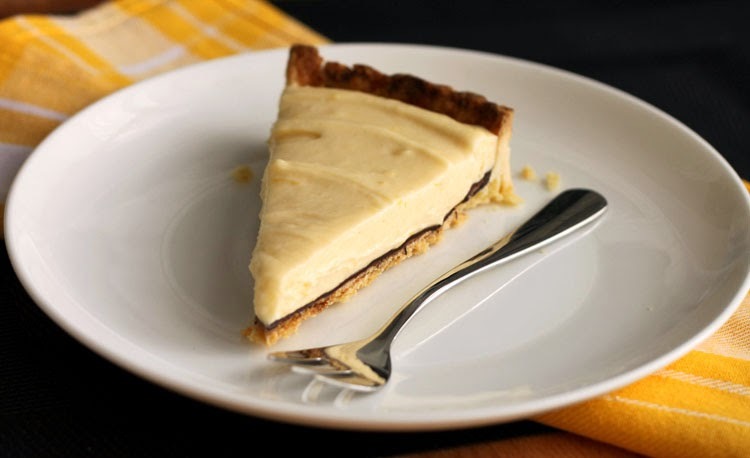 Refrigerate for 1 hour to set, but let the tart stand at room temperature for 20 minutes before serving.